We are obsessed with numbers. We lap them up. We get immense pleasure out of watching digits decrease and multiply as we peer over bank accounts and scales and Vegas roulette tables. Japanese role-playing games feed off this obsession, pelting us with giant numbers like we're targets at a carnival game. Over the course of a single RPG, characters' number-driven statistics will grow exponentially. It's not uncommon to watch a hero's health leap from measly double-digits to the thousands or tens of thousands. 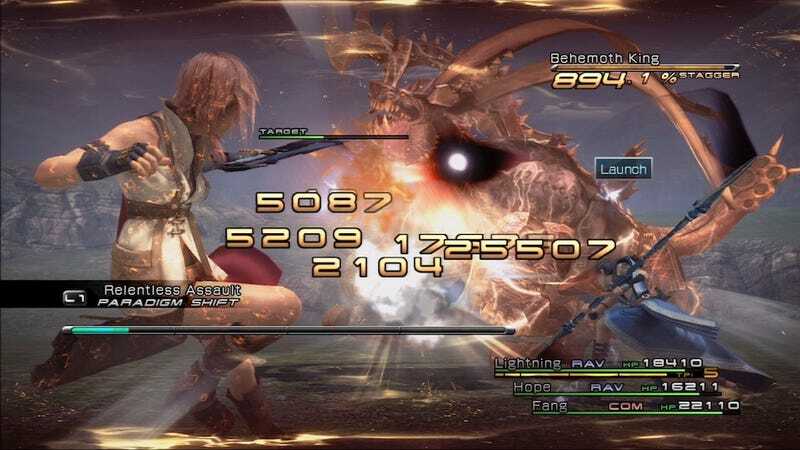 An optional boss in Final Fantasy XII, Yiazmat, has 50,112,254 HP. Many games cap your characters' levels at 99. The anime-inspired Disgaea series caps your characters' levels at 9,999. A boss in Disgaea 4 has 400,355,917 HP. The recently-released Growlanser IV has 40 endings. Every Suikoden game features at least 108 recruitable characters. In Final Fantasy VII, Cloud's sword is over 40,000 feet long. As a kid I was always obsessed with these numbers, even if I didn't know why. I'd rack up obscene amounts of damage with Knights of the Round while trying to take down Ruby Weapon's 800,000 HP, but I never quite understood why I was doing any of it. I just knew that it was fun, that it was addictive. I figured bigger numbers were appealing in the way that owning more toys was. Who doesn't want to have more of something? A bit later, when I was 13 or 14, I designed and programmed an online game called a MUD, a rudimentary text-based take on MMORPGs like World of Warcraft. You'd interact with other players and kill computer-driven monsters by typing in basic text commands, like "attack" or "get." Set in the world of Konami's classic Suikoden series, the game encouraged players to form guilds and forge alliances and slaughter as many monsters as humanly possible. The usual. Building the game was an exhilarating, exhausting experience that taught me quite a few interesting lessons. One of them: numbers matter, but not in the way I thought. The rush we get from seeing giant numbers on our screen doesn't happen because we're seeing giant numbers on our screen. What matters is what those numbers mean. When SuikodenMUD started, it was packed with giant numbers. Your health would start in the five-figure range. You'd do ridiculous amounts of damage from the outset. I figured: Why even bother starting lower? Everyone loves big numbers. I thought people would jump at the opportunity to wield swords that strike monsters for 50,000 damage a pop. They didn't. Nobody wanted to play. See, the rush we get from seeing giant numbers on our screen doesn't happen because we're seeing giant numbers on our screen. What matters is what those numbers mean. The story they tell. The gradual elevation from zero to hero, from a pathetic mercenary with 80-90 health to an all-powerful, world-devouring, 9999-HP-adorned warrior. When my Cloud cast Knights of the Round Table eight times and dealt some 80,000 damage to Ruby Weapon, it wasn't cool because of the numbers: it was cool because I brought Cloud to the point where he could reach those kind of numbers. So as SuikodenMUD went on, I found ways to satiate peoples' desire to watch numbers change. I gave them customizable skill trees with abilities that dealt different amounts of damage based on their decisions, so it would feel like every point came directly from their minds. I set up rare loot that might drop once in every million enemies, so people who found it would feel lucky, would remember exactly where and when they were when they finally got that jeweled sword or once-in-a-lifetime piece of armor. On occasional evenings I would run "Double Experience Nights" so that people could rack up numbers at warp speed, something that only felt special because it was so rare. While none of these concepts are new to practiced game designers, they might be unfamiliar to outspoken gamers who might feel like they're being manipulated by these hilariously large numbers in JRPGs. But every number has a story. It's not a bad thing to let them enchant you, to let yourself feel drawn by the power of constantly-increasing digits. There's nothing wrong with grinding for levels, watching your numbers and levels hike up massive mountains. And there's nothing wrong with letting big numbers make you feel like you've accomplished something. That's what they're there for.